This is where the New Zealanders attacked the German strongpoint at Polderhoek Chateau. You are now standing at the memorial commemorating Private Henry James Nicholas VC. This memorial is on what was the British, and the New Zealand, frontline in December 1917 in the Polygon Wood sector. If you look across those open fields, in front of you, down into the Reutelbeek Stream to the woods in the distance. That was land held by the Germans. And if you look down the line of this fence - to your left - where it goes down into the valley and climbs up again, you can see that open area to the left, on the high ground with the trees. Behind that was the area of the Polderhoek Chateau. All that was left of the Chateau was a series of bunkers and strongpoints held by the Germans. Looking up at that high ground, you can see that anyone in that area can observe and fire directly onto where you are standing. To relieve pressure on their positions, the New Zealand Division wanted to attack from your right - along that ridge - and take that green field, dislodging the Germans and clearing them from the Polderhoek Chateau area. The attack was to be carried out by Brigadier-General Braithwaite’s 2nd Infantry Brigade on 3 December at midday. The daylight factor was meant to be a total surprise to the Germans, who were accustomed to receiving an artillery barrage at that time of day. The New Zealand command had carefully thought the attack through, and rehearsed the tactics. The Otago and Canterbury Battalions, comprising roughly 800 men, would do the attack. At midday on 3 December, the New Zealand artillery opened up on the German defences 150 metres out into that green field. It failed because, instead of hitting the Germans, some of the British artillery fire landed in the New Zealand front trenches and caused heavy casualties. Unfortunately, the attack never got better after that. The Otagos and the Canterburys attacked and came under ferocious machine-gun fire from the German bunkers and dugouts. Soldiers fought their way through the wire that had been cut by artillery but still were pinned down and were taking serious losses from German artillery fire. It was during this attack that Private Henry Nicholas of the 1st Canterburys distinguished himself and was awarded the Victoria Cross. Nicholas was a boxer, cyclist, and an outstanding soldier. He rushed a bunker under fire and killed 12 Germans with rifle, grenades and bayonet, wounding four others in the effort. One man’s bravery was not enough, and the attack faltered short of the Chateau. The New Zealanders were stopped by German machine-gun and artillery fire and could go no further. They had gained about 50 metres of ground and hastily dug in where they lay. This small gain of ground was incorporated immediately into the British frontline. Elements of the Māori Pioneer Battalion, under Major Peter Buck Te Rangi Hīroa, went forward and consolidated those trenches that night. However, it completely exhausted the men, who were already fatigued after the October battles. Braithwaite, who had raised and led the 2nd Infantry Brigade since its formation, had to be relieved because his health broke down. The failure at Polderhoek marked the end of a bitter year for the New Zealand Division. Let’s move on to Hooge Crater. Continue along the road that brought you to Buttes New British Cemetery. Turn left at the T-junction on to Lotegatstraat. Follow this road until you come to an intersection. Turn left onto Oude Kortrijkstraat. Continue down this road for approximately 1 kilometre. You will see a memorial plaque on your right. Stand slightly to the left of the VC plaque facing the plaque. Drive out of the Lille Gate (Rijselpoort) at the roundabout, take the third exit onto the N37. At the next roundabout, continue straight on the N37. At the roundabout (Hellfire Corner), take the third exit and stay on the N37. Continue to follow the N37 for about 5km towards Zonnebeke. At the roundabout take the first exit towards Zonnebeke. Continue along the road and take the second right onto Guido Gezellelaan. Follow this road for about 1.6 kilometres, continuing straight on at the crossroads as the road becomes Citernestraat. 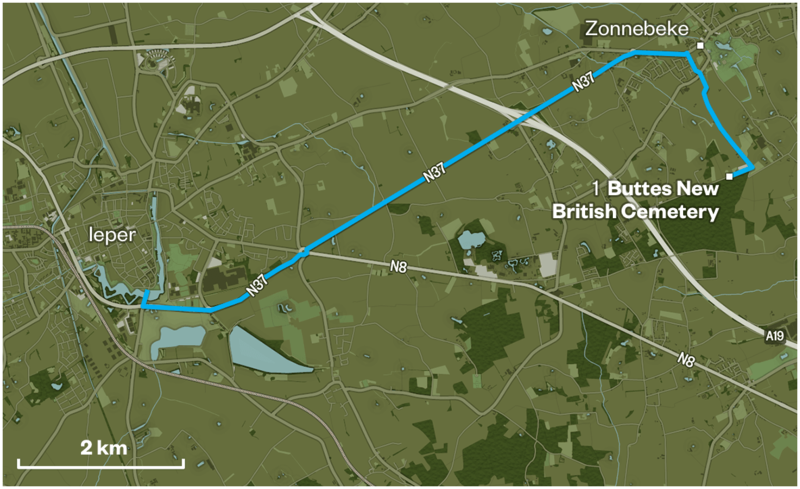 After the bend, take the right fork to Buttes New British Cemetery. Buttes New British Cemetery will be on your left. Enter the cemetery and walk up to the 5th Australian Division Memorial. Look out over the cemetery with your back to the 5th Australian Division Memorial. Note: This is also the overview stop for this trail. Allow for 2 to 4 hours to explore the complete Polygon Wood trail. If you’re short of time, simply visit stop 1: Buttes New British Cemetary for an overview of the entire Polygon Wood trail. This French cemetery holds over 4,000 soldiers from nearby battlefields and the site itself was close to the frontline during the First World War. Focusing on the Ypres Salient, this museum is a great introduction to Passchendaele. The site of fierce fighting and huge mine explosions, Hooge Crater now includes this Commonwealth War Graves Commission cemetery. This private museum offers a great collection of First World War memorabilia. An fun-filled theme park, Bellewaerde is great for the whole family. The next Ngā Tapuwae trail is Messines. Proceed to Gabion Farm.